For those lucky enough to be in a book club, we’ve got twelve recommendations that might have gone under the radar for your next year’s worth of reads. A young married couple is ripped apart by injustice – will they find their way back together? Humans have sought to build higher and higher throughout history, but what advances have we had to make along the way to satiate our need for height? With three independently-run book clubs on the second, third and last Thursdays of the month respectively, we thought it was time to claim the remaining Thursday and start a club of our own! 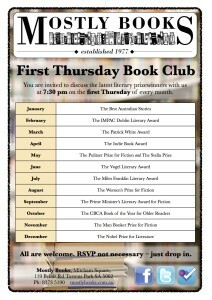 Our new First Thursday Book Club will be open to all on a drop-in basis. Starting in April with the Indie Book Award, we’ll read our way through a year’s worth of literary prizewinners. We’ll schedule an extra meeting to discuss the winner of the Stella Prize on the first available leap-Thursday (that is, the fourth Thursday of a month with five Thursdays) after the end of April. Then, while we wait for the award season to begin again, we’ll revisit some awards from the previous year that we couldn’t fit in. The discussion begins at 7:30 pm on Thursday November 7 with the winner of the Man Booker Prize for Fiction – whatever it turns out to be. Then, on Thursday December 5, we’ll discuss Alice Munro, who has just won the 2013 Nobel Prize for Literature.